Vans collaborates with acclaimed London fashion designer, Ashley Williams, as she reimagines four of Vans Classic footwear styles with playful and cheeky elements inspired by her latest collection. Inspired by living and breathing skate culture in her youth, Williams seamlessly merges her inherent sense of style with an “Off The Wall” attitude. The Vans and Ashley Williams collaboration will hit the street beginning this March. Known for her signature graphic prints and tongue-in-cheek designs, Ashley Williams decks out Vans’ first skate model, the Era. 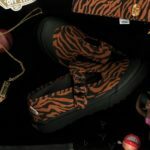 The multi-panel sneaker showcases a custom jug print across the upper and heel and is juxtaposed by a pink and black graphic zebra print. 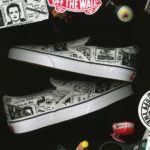 The sidewalls of the Era have been stamped with a custom Vans and Ashley checkerboard printed tape that mimics a heritage graphic print from Vans’ past. Vans’ original deck shoe, the Authentic has been updated with piercing details at the toe and heel. The Authentic is finished with custom “A” emblem on the top eyelet and Vans x Ashley Williams laces. 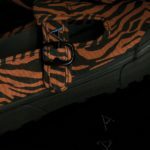 Vans Style 93 includes tiger printed canvas uppers with tonal black lugged outsole with an “A” metal eyelet detail and buckle. Rounding out the assortment is the Classic Slip-On which has been remastered to include a cheeky newspaper print. Each of the Classic footwear styles is finished with a custom Vans and Ashley Williams footbed graphic. The Vans and Ashley Williams collection will be available at Vans retail locations this March. Visit Vans.com/ashleywilliams for more information. Vans®, a VF Corporation (NYSE: VFC) brand, is the original action sports footwear, apparel and accessories brand. Vans® authentic collections are sold in 84 countries through a network of subsidiaries, distributors and international offices. Vans® has over 2,000 retail locations globally including owned, concession and partnership doors. The Vans® brand promotes creative self-expression in youth culture across action sports, art, music and street culture and delivers progressive platforms such as the Vans Park Series, Vans Triple Crown of Surfing®, Vans Pool Party, Vans Custom Culture, and Vans’ cultural hub and international music venue, House of Vans.